I get a lot of people asking questions about their prostate on this blog. People looking to lower PSA levels with food or to keep their PSA count lower. Other people are simply looking for ways to decrease the size of their prostate glands. For this reason I wanted to provide a simple and short resource list to make it easier to answer these questions. Above all the best way to stay healthy in all aspects of your life is to eat a more nutritious diet and to stay physically active. This helps keep cholesterol lower and helps prevent insulin resistance and diabetes. Diet and exercise also have a lot to do with prostate health so it’s worth keeping this in mind. In tune with the topic at hand however I’ll leave you with this short list of resources on shrinking your prostate. The authors of these resources are more authoritative on the subject than I am which is why I am directing you to them. They do cost a bit of money so consider their value before buying. Also please note that I have used affiliate links in this post. 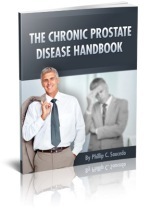 The Chronic Prostate Disease Handbook – This manual covers all aspects of naturally treating and managing various prostate problems such as enlarged prostate, elevated PSA, urinary tract infects, and prostatitis. If you are looking for a great resource for fixing your prostate then this is my #1 recommendation. Healthy Prostate: The Extensive Guide To Prevent and Heal Prostate Problems – Along the same lines this is an ebook that was recently published in traditional book format. Its author explains how to naturally shrink your prostate gland and deal with many common prostate problems naturally. It’s 322 pages of high quality information. This is far more information than I can provide on this blog and it is highly recommended. Alternatively you may find some value in reading some success stories from men who were diagnosed with prostate cancer but lived long and fruitful lives thereafter. In 7 Real Prostate Survivor Stories seven men go into great detail on how they dealt with their condition and thrived after their diagnosis. 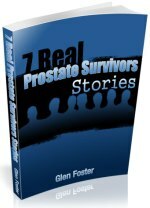 The ebook isn’t cheap but it does provide a lot of information on how you can emulate their success, shrink your prostate, get your PSA under control, and beat prostate cancer. Results for them may not be exactly the results you experience but their stories and advice are valuable. Disclaimers – As previously noted each of the links above are affiliate links and any purchases you make may result in me receiving compensation. You are under no obligation to use any of my links or buy any products mentioned in this post. Also, prostate cancer and other serious prostate problems HAVE to be treated by a doctor. Taking steps to proactively fight prostate issues naturally through lifestyle choices and diet is smart but a doctor should always be involved. Make sure you see your doctor as soon as possible to go over his or her advice on what kind of prostate treatments are best for you.